In the study, published today August 25 in JAMA Internal Medicine, the researchers hypothesize that in states where medical marijuana can be prescribed, patients may use pot to treat pain, either instead of prescription opiates, or to supplement them—and may thus require a lower dosage that is less likely to lead to a fatal problem. Not so fast, said Dr. Andrew Kolodny, chief medical officer at Phoenix House, a national nonprofit addiction treatment agency. He said that the immediate reduction in overdose deaths is extremely unlikely to be due to the substitute use of the herb, for one simple reason: Marijuana isn’t widely prescribed for chronic pain. “You don’t have primary care doctors in these states [prescribing] marijuana instead of Vicodin,” he said. 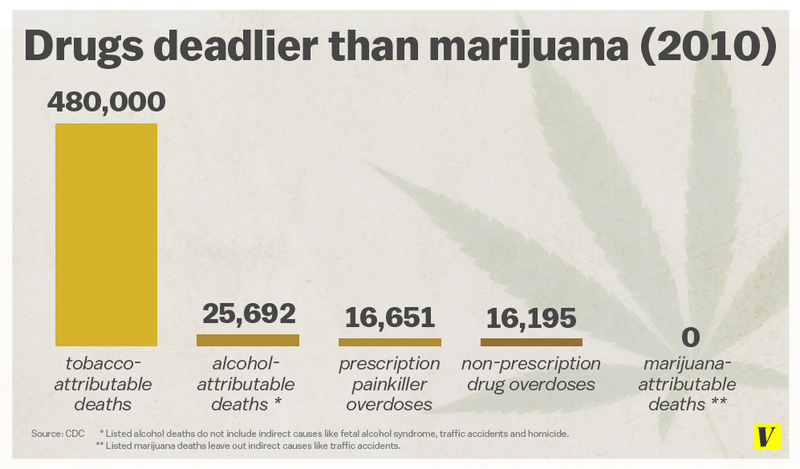 Even in states where medical marijuana is legal, it is only prescribed by a small subset of doctors, and, therefore, probably couldn’t explain the huge decrease in opiate-related overdose deaths. Kolodny says the study results are more likely due to a host of factors. One example is differences in state policies to cut down on over-prescribing of opiate medications. Also, many people who overdose on painkillers are already addicted, and these individuals are naturally among the most likely to take too much, Kolodny told Newsweek. States that pass progressive laws to treat addiction may be more likely to lower their rates of overdose deaths; for political reasons these states may also be more likely to legalize medical marijuana. “This is a good example of where policy change has gotten ahead of the science,” Barry said. She and Kolodny would probably agree on that point. Cannabis as an adjunct to or substitute for opiates in the treatment of chronic pain. There is a growing body of evidence to support the use of medical cannabis as an adjunct to or substitute for prescription opiates in the treatment of chronic pain. When used in conjunction with opiates, cannabinoids lead to a greater cumulative relief of pain, resulting in a reduction in the use of opiates (and associated side-effects) by patients in a clinical setting. Additionally, cannabinoids can prevent the development of tolerance to and withdrawal from opiates, and can even rekindle opiate analgesia after a prior dosage has become ineffective. Novel research suggests that cannabis may be useful in the treatment of problematic substance use. These findings suggest that increasing safe access to medical cannabis may reduce the personal and social harms associated with addiction, particularly in relation to the growing problematic use of pharmaceutical opiates. Despite a lack of regulatory oversight by federal governments in North America, community-based medical cannabis dispensaries have proven successful at supplying patients with a safe source of cannabis within an environment conducive to healing, and may be reducing the problematic use of pharmaceutical opiates and other potentially harmful substances in their communities.